Parthasarathy temple which is built way back in 8th century is dedicated to Lord Vishnu. The temple was constructed by Pallavas. The inscriptions in the temple reveal that the temple was built by Pallavas around 8th century and got renovated in Vijayanagar Dynasty in 11th century. This is the only temple where Lord Vishnu can be worshipped along with his three generations (Brother, Son and Grandson). 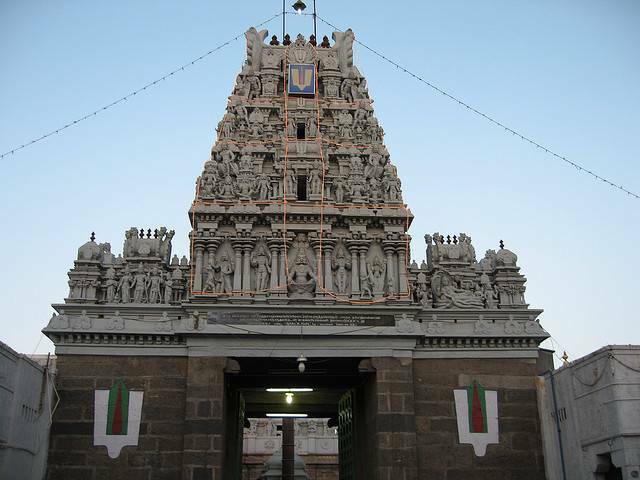 This temple is one of the oldest structures in Chennai and located in Triplicane area of Chennai. The temple has splendidly decorated pillars, gopurams and Vimanas. Brahmostavam, Udayavar Utsavam and Vaikunta Ekadesi festivals are celebrated on a large scale every year. The name “Parthasarathy” literally means “Charioteer for King Arjuna”. As per Hindu Mythology and Great Indian Epic “Mahabharata”, Lord Krishna served as a charioteer for King Arjuna in the battle between Kauravas and Pandavas. Tourists can see scars caused by injuries in war on the face of Bronze statue of Lord Krishna in the temple. Also the temple has five wells which are considered as even more sacred than River Ganges. Temple remains closed between 12PM - 4PM. Temple is usually very crowded on weekends, advisable to go in the morning on a weekday.